Aqui tenéis el teaser trailer de Scream 4 en baja calidad. El próximo martes podréis disfrutarlo con mejor calidad despues de que sean emitidos por television los Spike´s Tv Scream Awards. "Welcome home Sidney. You're a survivor aren't you Sidney, but what good is it to be a survivor when everyone close to﻿ you is DEAD! You can't save them... all you can do is WATCH!" 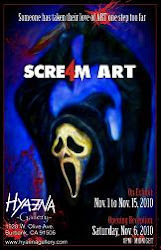 Here's the teaser trailer for Scream 4 in low quality. On Tuesday you can enjoy it with a better quality after the retransmision of the Spike TV's Scream Awards.